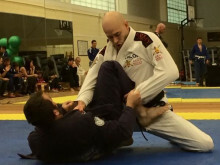 BJJ Black Belt Andy Roberts, who runs his own successful gym in Farnborough, heads up the modern day army Jiu Jitsu team and teaches regularly in Aldesrhot. At the same base over a 100 years ago, McLaglen turned up to instruct a group of Army Gym Staff Instructors in the principles of self-defence and Jiu Jitsu. Leopold McLaglen was something of a character and adventurer who spent much of his life in the military. He claimed to have served in the Boer War, and his service record lists him as a member of the Royal Military Army Corps in World War One. Much of McLaglen’s youth was spent in Japan where he acquired some knowledge of Japanese martial arts, and he subsequently acquired renown as a “master” of Jiu Jitsu, touring Australia, India, Asia and beyond to teach seminars and lecture. His claim to fame as world champion was a reported win over T. H. Kanada before an audience of 15,000 in New Westminster in 1907. Yet McLaglen, who once appeared in a film called The Bars of Iron (1920), was something of a showman and sources suggest that his displays were staged to create theatrical display to play up tall tales of success rather than being real contests or practical demonstrations of skill. The Vancouver Daily Province observed of his match with Kanada, "There was little, if any, jiu-jitsu to the performance… It was apparent to everyone that McLaglen’s knowledge of the game could be covered with a pinhead." Leopold certainly had a flair for the dramatic. Eager listeners at one lecture heard McLaglen reveal that the Japanese jealously guarded the deadly secret of the science of Jiu Jitsu, the death blow. To Europeans, they only taught the basics of these blows and of the ‘sleep producing hold’ (a choke). This skill for theatre seemed to run in the family. Brother Victor was also a military man who served in the Duke of Cambridge's Own (Middlesex Regiment) and an accomplished boxer performing in vaudevilles and circus shows. Like Leopold, he turned his talents to the silver screen, earning an Oscar for his role in the 1935 film the Informer. Leopold the Mighty was perhaps not an Undefeated World Champion Master of Jiu Jitsu, but McLaglen’s life and travels as he indulged his passion for martial arts were certainly exciting! While Leopold may not have had an actual world title to his name, modern day British Army BJJ practitioners are the real deal. 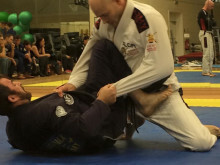 Brazilian Jiu Jitsu has taken off in the armed forces with the art practised at many bases around the country, headed up by Officer in Command Major Donald MacIntyre and the British Army BJJ Team Captain Staff Sergeant Mark Badham. 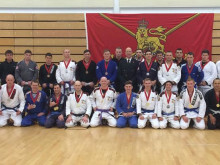 Prior to being officially recognised, BJJ was a demonstration sport at Army Championships for 3 years, but its full recognition as a sport in the Armed Forces officially from 9 September 2015 recognised the growth of BJJ in all the armed forces. 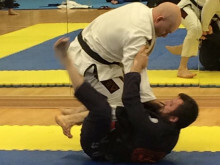 RAF, Marines and Army teams are supported by established civilian black belts like Andy Roberts based in Surrey and Kev Capel based in Buckinghamshire. And these men and women in the Armed Forces are winning major titles and medals in the biggest competitions in the world. The British Army team returned from the largest European Championship this year in history with four medals including gold, silver and two bronze. 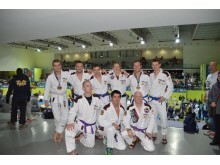 Ten Army BJJ athletes, from across the ranks, were amongst the 3500 competitors from around the world in the five-day championship, and MacIntrye himself was crowned European champion. 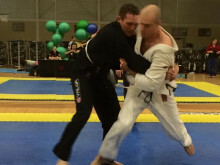 Whilst a competition sport and a very fun past time, BJJ is also serious self-defence. The power to overcome to a bigger, stronger opponent with skill and technique lies at the heart of Brazilian Jiu Jitsu, which translates as the ‘gentle art’. Students use leverage and position to achieve submission holds and chokes, a ‘gentle’ form of combat rather than arts using weapons or striking. McLaglen himself made much of this aspect of Jiu Jistu and authored no less than 4 books on the subject, including Ju Jitsu for Girls (1922). At a course delivered in Shanghai in March 1914, the Japan Times reported that ‘Capt. McLaglen has had pupils under his instruction who have weighed nine stone [126 pounds] and been able to defeat professional athletes weighing fifteen stone [210 pounds].’ McLaglen liked to tell that as a schoolboy he was always getting bullied. The Japanese began to teach him Jiu Jitsu and in a month he was able to defeat any boy in the school. By nineteen years of age, the student had become the master and was able to defeat his instructors. Although the story had perhaps more than a touch of fiction, with elements of the Karate Kid and Star Wars all rolled into one, hardly surprising it had appeal! McLaglen’s last stint in the military during World War Two was at Brize Norton in Oxfordshire, an RAF base which now holds its own Brazilian Jiu Jitsu classes. Today Brazilian Jiu Jitsu, properly practised and trained, proves that the skills and techniques of the ‘gentle art’ really can be effective. Gentle but powerful, as US serviceman and BJJ student Spencer Stone demonstrated last year, when he helped two fellow soldiers disarm a gunman on a Eurostar train in August, using a choking technique learned in classes. BJJ’s effectiveness as a self -defence system, as a form of exercise, its power to instil self-confidence, and as an art which embodies the traditional bushido principles of honour and loyalty highlights the appeal of this rapidly growing marital art, in the British army and beyond. 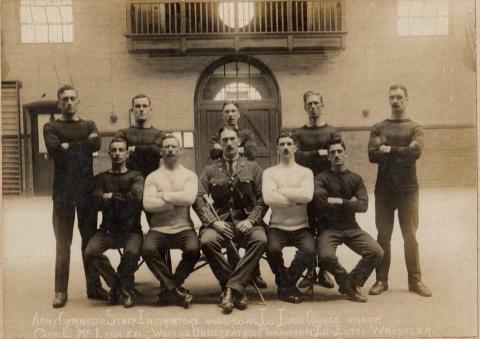 When the British Army BJJ tournament kicks off on Saturday morning, almost 102 years to the day when McLaglen started his Shanghai tour, men and women of the armed forces will show what BJJ is really about. Hi there - good article, but although Leopold McLaglen was a colourful character, it's worth noting that a legitimate jiujitsu expert trained British Army soldiers a number of years before McLaglen did. Sadakazu Uyenishi had arrived in London in 1900 and over the next nine years he both taught (first at the famous Bartitsu School of Arms, later at his own, successful dojo in Golden Square) and competed in numerous challenge matches, as well as performing demos and teaching soldiers at Aldershot and Shorncliffe. 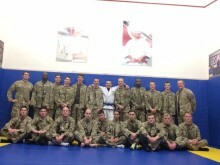 British Armed forces select Brazilian Jiu Jitsu as its newest combat discipline in decades!